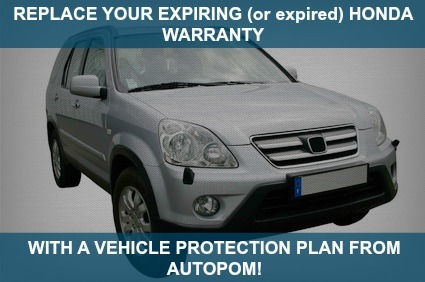 Honda Extended Warranty or Vehicle Protection Plan - autopom! Is your manufacturer’s original warranty expiring or already expired? Consider purchasing a Honda Extended Warranty or a Vehicle Protection Plan from autopom! Is your manufacturer’s original warranty expiring or did you just buy a used Honda? Consider purchasing a Honda Extended Warranty or a vehicle protection plan from autopom! The Honda brand is synonymous with the words safe and reliable. You will find very few people to dispute that. In fact, Honda has been a highly successful brand in the U.S. for decades now, mostly because of their reputation for making safe and reliable cars. Stories abound of Hondas that have gone much more than 100,000 miles with nothing more than routine maintenance needed on them. If this is the case, why would you want or need a Honda extended warranty or vehicle protection plan? In spite of its solid reputation, Honda does not make perfect cars. Just Google “Honda problems” and you will see that millions of results appear. Plus, like many other vehicle manufacturers, Honda has gone through its share of recalls in recent years. And if you drive (or drove) one of the older model Accords, Civics or Odysseys that suffered automatic transmission failure well before the 100,000-mile-mark, you know exactly how imperfect a Honda can be. If you are still not convinced that a Honda extended warranty or vehicle protection plan may be a good idea, consider the following information, especially if you drive an Accord or a Civic Hybrid. The Honda Accord is continually one of the best selling cars in the U.S. But did you know that the highest number of complaints found about Honda vehicles is against Accords? In fact, more than half of the 18,416 complaints about Honda on www.carcomplaints.com are against an Accord! Or, if you have made the eco-friendly choice of buying a Honda Civic Hybrid, you most certainly need to consider a Honda extended warranty or vehicle protection plan from autopom! According to Consumer Reports, the Honda Civic Hybrid has some serious reliability concerns, which if aren’t covered by extended protection, cost more than $2,000 to fix! Request a free, no-hassle quote from autopom!